that are ready for body armor disposal. And Chief Doreen Olko, like other police officials, faces a dilemma: The vests aren’t good enough for her officers, but they can’t be thrown away, either, for fear they may wind up in the wrong hands. Federal guidelines say body armor has a five-year life. So, when retiring them, some departments think environmentally. Others think about future cops. The Roseville Police Department is expecting 60 new bullet proof vests, thanks to a federal grant and drug forfeiture money, said Deputy Chief James Berlin. 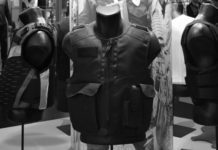 They’ll recycle their old vests with Fiber Brokers International, an Alabama company that has been recycling ballistics materials and solving the body armor disposal problem for seven years. Both Olko and Detroit Police Department spokeswoman Sgt. Eren Stephens said they are interested in body armor disposal. 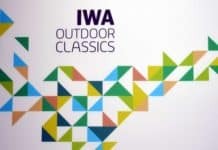 Many of the vests are made of aramid fibers, which are strong and heat-resistant. Kevlar is a common aramid brand name. Regina Love, Fiber Brokers‘ project manager, said they will accept, without charge, shipments of two to 200 pieces of body armor. 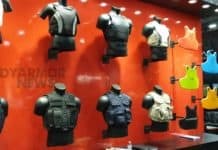 The body armor disposal company strips the vests of their bulletproof material, any bullets and nylon casings. The material is then sent to manufacturers, who turn it into strong, heat-resistant items like brake pads, tire treads and rope. “We guarantee it doesn’t go back into ballistic use again,” Love said. Metro Detroit police departments that have recycled with Fiber Brokers include Sterling Heights, Bloomfield Township and Pontiac. In the past, Ferndale sent vests to military operations overseas, said Lt. William Wilson. Now they stay in-house for use by auxiliary officers. Utica police Sgt. David Faber said their vests go to the Macomb Regional Police Academy at Macomb Community College. Academy director Charles Craft said their latest batch of retired vests came from the Sterling Heights Police Department, and each cadet trains in a vest to get used to the weight, heat and feel of body armor. 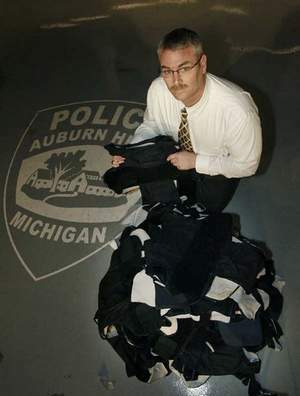 The Macomb County Sheriff’s Department and Southfield police destroy their vests in-house. Plymouth police take their vests out to the firing range on training days to practice with different firearms and ammunition. “It is left up to the officers to destroy them,” said Plymouth Public Safety Director Al Cox.